It is my favourite part of Strasbourg. Here you find strange, narrow streets and passage ways, and the most beautiful ancient half-timbered and stone buildings you may think of. 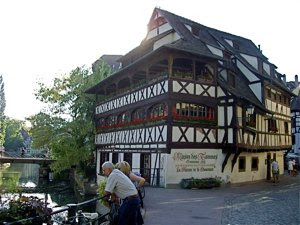 Half timbered buildings as this one, Le Maison de Tanneurs, the Tanners building, built in 1572. In Petite-France the old buildings line up along both sides of the canals and to see them even better it is a good idea to join one of many river boats that constantly drive along the banks of Grand Île. You will, on your river cruise see that most of the bridges along the canal are either draw bridges that may lift up, or may slide sideways to make room for the boats that pass. There are also other remains from the small enterprises that once were located by the rivers. The canals have many locks as well, in order for boats to descend or ascend to different levels in the river. As they pass, people assemble by the canals to watch. Petite-France is certainly the place to eat in Strasbourg. We had a great meal at L’Eveil des Sens, and I will later write on another great meal at the restaurant Au Pont de Saint Martin. The first time I visited Strasbourg I had another great meal here. To sit in such a historic setting made such an impression on a 17 year old college student, that hardly had been outside Scandinavia. Another impressive monument in Petite-France is the medieval bridge Ponts Couverts. 4 tall towers crossing the river. 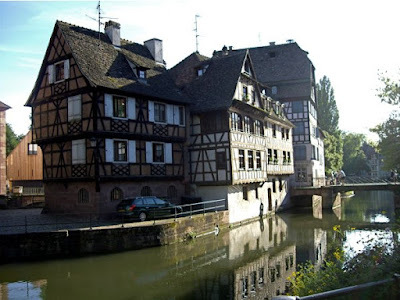 This was a sight that made a very strong impression on me, during my first visit in Strasbourg as a teenager. Another interesting sight close to the Post Couverts is the Barrage Vauban. 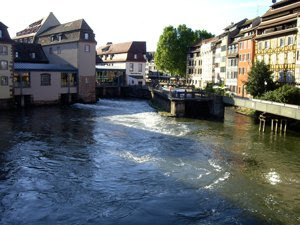 This weir crossing the river Ill, was named after Marquis de Vauban and was built in the 17th century. 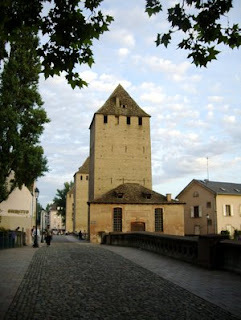 It is several stories high, and has a panoramic platform on top, where you have a great view to the Petit-France area, the Ponts Couverts and the tall tower of the Strasbourg cathedral in the background.